› Keep Your Cat Healthy › Cat Friendly Practice® › What to Expect at a Cat Friendly Practice › Why Choose a Cat Friendly Practice? Physical exams are performed in a manner and location where they are least stressful to your cat which might include the bottom of the carrier. Team members use Feline Friendly Handling Guidelines and Nursing Guidelines which ensures your cat is handled gently and respectfully. They are trained to identify subtle signs of sickness and pain in cats. Physical exams are performed in a manner and location where they are least stressful to your cat (floor, bench, bottom of carrier, table, or veterinarian’s lap). All Cat Friendly Practices® are designed to help reduce the stress of visiting the veterinary office. They may have a cat-only waiting area or alternate way to separate cats from other animals, and are free of excessive noise. Cat Friendly Practices® know your cat’s senses are on high alert and seeing, hearing, or smelling other animals can produce anxiety. 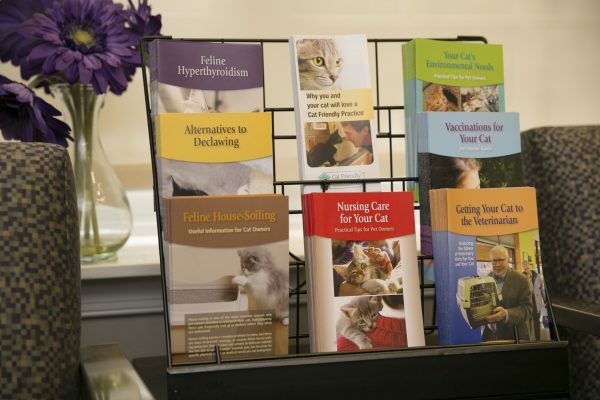 Cat Friendly Practices® have feline specific educational materials readily available for their clients. 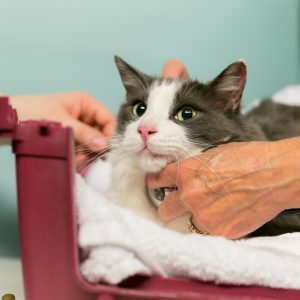 They also educate their clients on important feline issues like behavior, nutrition, environmental enrichment in the home, zoonotic diseases, parasite prevention, and normal scratching behaviors. Cat Friendly Practices® recommend annual check-ups for all cats or twice a year for senior cats or those with chronic conditions. All examinations must include a pain, nutrition, and behavior assessment. All recommendations are individualized to each cat based on life stage, lifestyle, and health concerns. Vaccinations are given based upon the AAFP Feline Vaccine Advisory Panel Guidelines. Cat Friendly Practices® have feline specific educational materials readily available for you to learn more about your cat. All staff who work with cats must meet a minimum requirement of continuing education including hours specifically in feline medicine and surgery. Team members are alert to signs of feline stress that may occur when cats are hospitalized. The emotional status of each cat is considered when developing all treatment plans. Cats are offered “safe havens” or hiding places where they can retreat and relax. Clients are encouraged to bring in a blanket or other item that smells like “home” to help keep their cat calm. Cat Friendly Practices® know that good dental health is crucial to the overall wellness of cats. So they offer dentistry and dental radiographs or can refer you to a Cat Friendly Practice® that offers these services. Cat Friendly Practices® follow Pain Management Guidelines to ensure your cat’s pain level is carefully monitored before and after procedures. This is especially important if he has a painful condition like degenerative joint disease, also known as arthritis. There is a dedicated operating room with feline-sized equipment, as well as equipment used for monitoring, anesthesia, and radiography. These items help the veterinary team perform procedures and surgeries with the highest level of feline care. All Cat Friendly Practices® have basic laboratory equipment so they can run important tests through blood and urine collection on-site.